Air-cooled jumper cables from Weld Systems Integrators are ideal for a variety of industries and applications including resistance welding, resistance heating and bus bar systems. Every jumper cable is designed for maximum efficiency, longer life and greater flexibility. Our in-house engineering team can assist with custom designs and unique customer specifications. 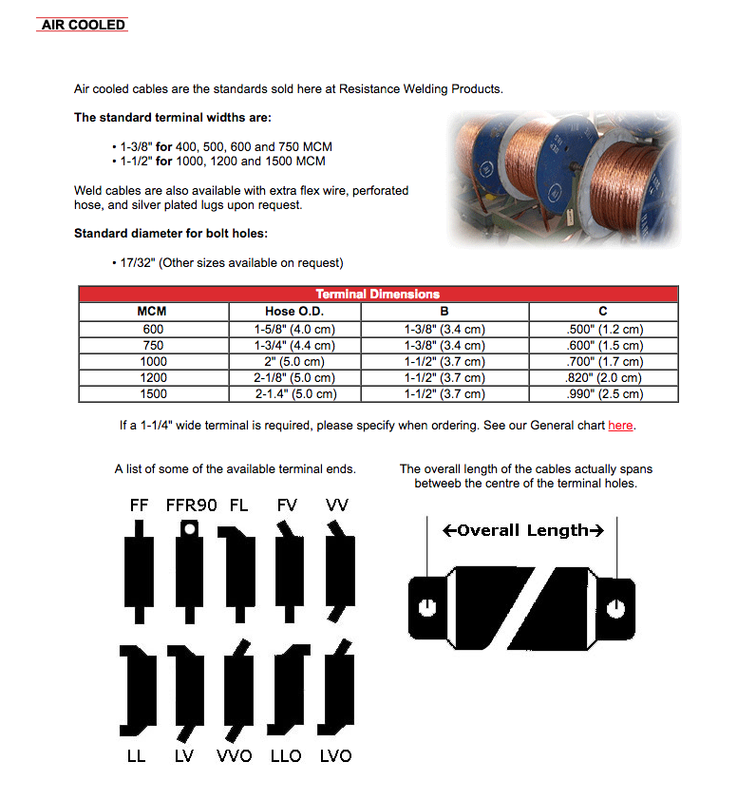 Our air-cooled jumper cables will meet your every welding requirement for this type of cable. Jumpers are available in circular mill sizes from 400 MCM to 2000 MCM as standards. Other circular mill sizes and extra-flexible cables are available on request. Weld Systems Integrators maintains an inventory of air-cooled jumper cables at our Warrensville Heights, OHIO location. For immediate assistance, please give us a call at 844-WSI-WELD. Terminals can be furnished with any desired angle— see Standard Terminal Configurations below. The 1-1/2” width will be supplied up to and including 1200 MCM size. The 1500 MCM size will be furnished in the 1-3/8” width. The 2000 MCM size will be furnished in the 1-1/2” width. 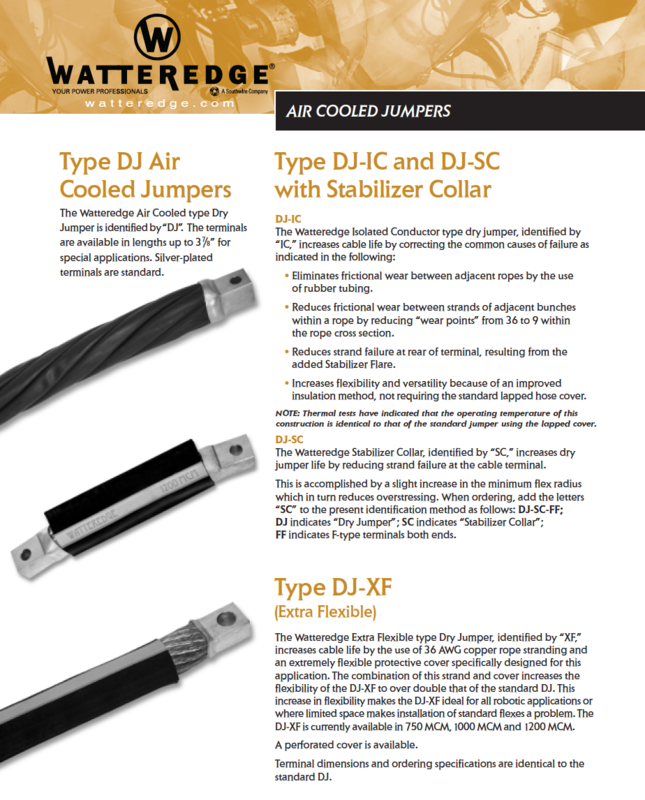 Terminal Length: The contact surface length of Air-Cooled Jumpers is 1-9/16”. Other lengths can be furnished if specially ordered. Bolt Hole Size: All Air-Cooled Jumpers are drilled with 17/32” bolt holes, unless ordered otherwise. When ordering, please specify the ACJ/MCM size, length of the bolt hole center to the bolt hole center, and the terminals required. If no terminals are specified, the CFF terminals will be furnished. 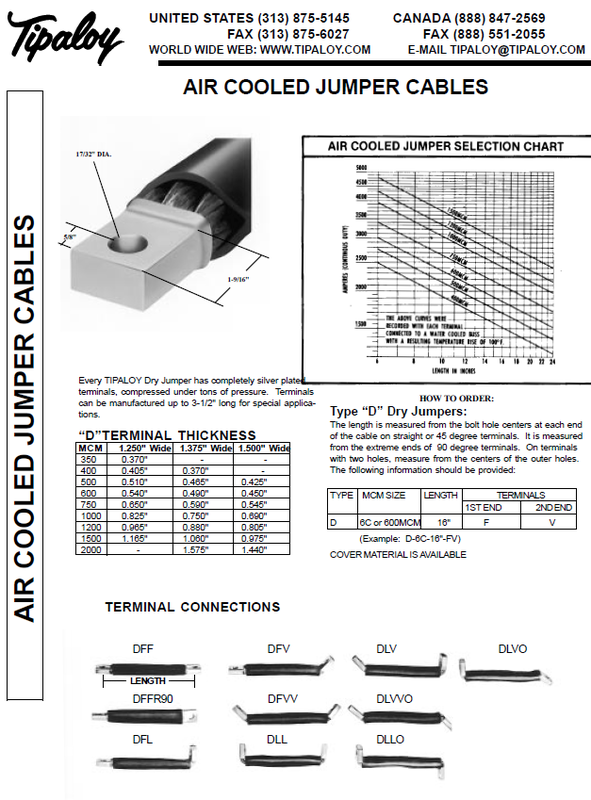 CONTACT Weld Systems Integrators for more information on AIR-COOLED JUMPER CABLES. For immediate assistance, please feel free to give us a call at 844-WSI-WELD. Download current WSI Brochures and Catalogs in PDF format. For more information or to request a quote on WSI resistance welding products and equipment, please give us a call at 844-WSI-WELD or +1-216-475-5629.